Sunlight comes around a cloud. In common usage, the term light (or visible light) refers to electromagnetic radiation in a wavelength range that is visible to the human eye (about 400–700 nanometers (nm) (15.7-27.6 millionths of an inch)). In a scientific context, the word light may be used to refer to the entire electromagnetic spectrum or any part thereof. The study of light and its interaction with matter is termed optics. The observation and study of optical phenomena such as rainbows and the aurora borealis offer many clues about the nature of light as well as much enjoyment. There are many sources of light. Most often, a body that is heated to a particular temperature emits a characteristic spectrum of radiation. For example, the radiation emitted by the Sun's chromosphere (at around 6,000 K) peaks in the visible region of the electromagnetic spectrum; incandescent light bulbs emit only around 10 percent of their energy as visible light and the remainder as infrared; and solid particles glow when heated in a fire. A body at the temperature of a human being emits mainly infrared radiation. When the temperature is raised, the emission peak shifts to shorter wavelengths. For example, the heating of a metal first produces a red glow, then a white one. A natural gas flame or a welder's torch produces a blue color characteristic of very high temperatures. Atoms absorb and emit light at characteristic frequencies, corresponding to particular energies. As a result, there are characteristic lines in their absorption and emission spectra. In many cases, the emissions are spontaneous, such as from light-emitting diodes, gas discharge lamps (such as neon lamps, neon signs, and mercury-vapor lamps), and flames (for example, sodium in a gas flame emits characteristic yellow light). Emission can also be stimulated, as in the case of a laser or microwave maser. Visible radiation can also be produced by the acceleration of free charged particles, such as electrons. Examples include cyclotron radiation, synchrotron radiation, and bremsstrahlung radiation. Particles moving through a medium faster than the speed of light in that medium can produce visible Cherenkov radiation. Certain chemicals produce visible radiation by what is called chemoluminescence. When living things emit visible light, the process is called bioluminescence. For example, fireflies produce light by this means, and boats moving through water can disturb plankton, which produce a glowing wake. Some substances produce light when they are illuminated by more energetic radiation, a process known as fluorescence. This phenomenon is utilized in fluorescent lights. Some substances emit light slowly after excitation by more energetic radiation. This phenomenon is known as phosphorescence. Phosphorescent materials can also be excited by bombarding them with subatomic particles. This property is used in the cathode ray tubes of television sets and is called cathodoluminescence. Mechanisms that generate high-energy gamma rays include radioactive decay and particle–antiparticle annihilation. According to the current scientific concept of light, it is composed of elementary particles called photons, which can exhibit certain properties of both waves and particles. Photons are therefore said to have wave-particle duality. Polarization or direction of the wave oscillation. The speed of light in a vacuum is exactly 299,792,458 meters per second (m/s) (about 186,282.397 miles per second). The speed of light depends upon the medium in which it is traveling, and the speed will be lower in a transparent medium. Although commonly called the "velocity of light," technically the word velocity is a vector quantity, having both magnitude and direction. Speed refers only to the magnitude of the velocity vector. This fixed definition of the speed of light is a result of the modern attempt, in physics, to define the basic unit of length in terms of the speed of light, rather than defining the speed of light in terms of a length. Different physicists have attempted to measure the speed of light throughout history. Galileo attempted to measure the speed of light in the seventeenth century. A good early experiment to measure the speed of light was conducted by Ole Rømer, a Danish physicist, in 1676. Using a telescope, Ole observed the motions of Jupiter and one of its moons, Io. Noting discrepancies in the apparent period of Io's orbit, Rømer calculated that light takes about 18 minutes to traverse the diameter of Earth's orbit. Unfortunately, this was not a value that was known at that time. If Ole had known the diameter of the Earth's orbit, he would have calculated a speed of 227,000,000 m/s. Léon Foucault used an experiment which used rotating mirrors to obtain a value of 298,000,000 m/s in 1862. Albert A. Michelson conducted experiments on the speed of light from 1877 until his death in 1931. He refined Foucault's methods in 1926 using improved rotating mirrors to measure the time it took light to make a round trip from Mt. Wilson to Mt. San Antonio in California. The precise measurements yielded a speed of 299,796,000 m/s. When a beam of light traveling through a medium (such as air) strikes another medium (such as glass), a portion of that light is absorbed by the second medium while another portion bounces back into the first medium. The return of light into the medium from which it came is called reflection. The reflection of visible light allows us to see objects that do not produce their own light. Reflection of light may be specular (that is, mirror-like) or diffuse (that is, not retaining the image, only the energy) depending on the nature of the interface between the two media. Reflection of light by a mirror is the basic example of specular reflection. A mirror consists of a glass sheet in front of a metallic coating where the reflection actually occurs. 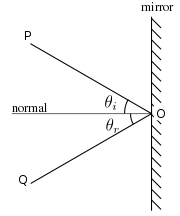 In the diagram, a light ray PO strikes a vertical mirror at point O, and the reflected ray is OQ. By projecting an imaginary line through point O perpendicular to the mirror, known as the normal, we can measure the angle of incidence, θi and the angle of reflection, θr. The law of reflection states that θi = θr, or in other words, the angle of incidence equals the angle of reflection. A black triggerfish and its reflection in the water surface. In fact, reflection of light may occur whenever light travels from a medium of a given refractive index (see below) into a medium with a different refractive index. In the most general case, a certain fraction of the light is reflected from the interface, and the remainder is refracted. Specular reflection at a curved surface forms an image that may be magnified or demagnified; curved mirrors have optical power. Such mirrors may have surfaces that are spherical or parabolic. When light strikes a rough or granular surface, it bounces off in all directions due to irregularities of the interface. Thus, an image is not formed. This is called diffuse reflection. The exact form of the reflection depends on the structure of the surface. A beam of white light (entering upwards from the right) is dispersed into its constituent colors by its passage through a prism. The fainter beam of white light exiting to the upper right has been reflected (without dispersion) off the first surface of the prism. When a beam of light crosses the boundary between a vacuum and another medium, or between two different media, the wavelength of the light changes, but the frequency remains constant. If the beam of light is not orthogonal (perpendicular) to the boundary, the change in wavelength results in a change in the direction of the beam. This change of direction is known as refraction. where v denotes the speed that light travels in the transparent medium. Note that n = 1 in a vacuum and n > 1 in another medium through which light travels. The refraction quality of lenses is frequently used to manipulate light in order to change the apparent size of images. Magnifying glasses, spectacles, contact lenses, microscopes and refracting telescopes are all examples of this manipulation. The intensity pattern formed on a screen by the diffraction of a laser beam passing through a square aperture. 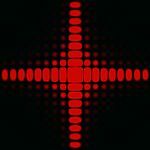 Diffraction refers to various phenomena associated with wave propagation, such as the bending, spreading and interference of waves passing by an object or aperture that disrupts the wave. Given that light (electromagnetic radiation) has wave-like properties, it undergoes diffraction. When light from a compact source falls on a larger solid object, the shadow of the object shows small fringes near its edges. This is an example of diffraction. Another example is the rainbow pattern we see on the surface of a CD or DVD—in this case, the closely spaced tracks on the disc act as a diffraction grating. Diffraction in the atmosphere by small particles in it can produce a bright ring around a bright light source such as the Sun or the Moon. Thomas Young's sketch of two-slit diffraction, which he presented to the Royal Society in 1803. Young's experiments supported the theory that light consists of waves. The effects of the diffraction of light were first carefully observed and characterized by Francesco Maria Grimaldi. He also coined the term diffraction, from the Latin diffringere ("to break into pieces"), referring to light breaking up into different directions. The results of Grimaldi's observations were published posthumously in 1665. Isaac Newton studied these effects and attributed them to inflexion of light rays. James Gregory (1638–1675) observed the diffraction patterns caused by a bird feather, which was effectively the first diffraction grating. In 1803, Thomas Young did his famous experiment observing diffraction from two closely spaced slits. Explaining his results by interference of the waves emanating from the two different slits, he deduced that light must propagate as waves. Augustin-Jean Fresnel did more definitive studies and calculations of diffraction, published in 1815 and 1818, and thereby gave great support to the wave theory of light that had been advanced by Christiaan Huygens and reinvigorated by Young, against Newton's particle theory. The very heart of the explanation of all diffraction phenomena is interference between waves. When two waves combine, their displacements add, causing either a lesser or greater total displacement, depending on the phase difference between the two waves. The effect of diffraction from an opaque object can be seen as interference between different parts of the wave beyond the diffraction object. The pattern formed by this interference is dependent on the wavelength of the wave, which for example gives rise to the rainbow pattern on a CD. Most diffraction phenomena can be understood in terms of a few simple concepts that are illustrated below. If we consider two such narrow apertures, the two radial waves emanating from these apertures can interfere with each other. At some points in space, the wave emanating from one aperture is always in phase with the other, that is, they both go upward at that point—this is called constructive interference and results in a greater total amplitude. At other points, one radial wave is out of phase with the other by one-half of a wavelength, so that when one wave is going up, the other is going down, so the total amplitude is decreased—this is called destructive interference. The overall result is that there are regions where there is no wave and other regions where the wave is amplified. Slits significantly wider than a wavelength will also show diffraction that is most noticeable near their edges. The center part of the wave shows limited effects at short distances, but exhibits a stable diffraction pattern at longer distances. This pattern is most easily understood and calculated as the interference pattern of a large number of simple sources spaced closely and evenly across the slit width. In ancient India, the philosophical schools of Samkhya and Vaisheshika, from around the sixth to fifth centuries B.C.E., developed theories on light. According to the Samkhya school, light is one of the five fundamental "subtle" elements (tanmatra) out of which emerge the gross elements. The atomicity of these elements is not specifically mentioned, and it appears that they were actually taken to be continuous. On the other hand, the Vaisheshika school gives an atomic theory of the physical world on the non-atomic ground of ether, space and time. The basic atoms are those of earth (prthivı), water (apas), fire (tejas), and air (vayu), that should not be confused with the ordinary meaning of these terms. These atoms are taken to form binary molecules that combine further to form larger molecules. Motion is defined in terms of the movement of the physical atoms and it appears that it is taken to be non-instantaneous. Light rays are taken to be a stream of high-velocity of tejas (fire) atoms. The particles of light can exhibit different characteristics, depending on the speed and the arrangements of the tejas atoms. Around the first century B.C.E., the Vishnu Purana refers to sunlight as the "the seven rays of the sun." Later in 499, Aryabhata, who proposed a heliocentric Solar System in his Aryabhatiya, wrote that the planets and the Moon do not have their own light but reflect the light of the Sun. Indian Buddhists, such as Dignāga of the fifth century and Dharmakirti of the seventh century, developed a type of atomism that is a philosophy about reality being composed of atomic entities that are momentary flashes of light or energy. They viewed light as being composed of atomic entities equivalent to energy, similar to the modern concept of photons, but they also viewed all of matter as being composed of these light/energy particles. In the fifth century B.C.E., Empedocles postulated that everything was composed of four elements: fire, air, earth, and water. He believed that Aphrodite made the human eye out of the four elements and that she lit the fire in the eye that shone out from the eye, making sight possible. If this were true, then one should be able to see during the night just as well as during the day, so Empedocles postulated an interaction between rays from the eyes and rays from a source such as the Sun. Lucretius, a Roman philosopher and poet who lived in the first century B.C.E., carried on the ideas of earlier Greek atomists. In his philosophical poem De Rerum Natura (On the Nature of Things), he wrote: "The light and heat of the sun; these are composed of minute atoms which, when they are shoved off, lose no time in shooting right across the interspace of air in the direction imparted by the shove." This view, despite its similarity to later particle theories, was not generally accepted and light was still theorized as emanating from the eye. Ptolemy (circa second century) wrote about the refraction of light, and developed a theory of vision that objects are seen by rays of light emanating from the eyes. The Muslim scientist Ibn al-Haytham (c. 965-1040), known as Alhacen (or Alhazen) in the West, developed a broad theory that explained vision using geometry and anatomy, in his Book of Optics. He stated that each point on an illuminated area or object radiates light rays in every direction, but that only one ray from each point, which strikes the eye perpendicularly, can be seen. The other rays strike at different angles and are not seen. He described the pinhole camera and invented the camera obscura, which produces an inverted image, and used it as an example to support his argument. This contradicted Ptolemy's theory of vision that objects are seen by rays of light emanating from the eyes. Alhacen held light rays to be streams of minute particles that traveled at a finite speed. He improved on Ptolemy's theory of the refraction of light and went on to discover the laws of refraction. He also carried out the first experiments on the dispersion of light into its constituent colors. His major work Kitab al-Manazir was translated into Latin in the Middle Ages, as well his book dealing with the colors of sunset. He dealt at length with the theory of various physical phenomena like shadows, eclipses, the rainbow. He also attempted to explain binocular vision, and gave a correct explanation of the apparent increase in sizes of the Sun and the Moon when they are near the horizon. Because of his extensive research on optics, Al-Haytham is considered the father of modern optics. Al-Haytham also correctly argued that we see objects because the Sun's rays of light, which he believed to be streams of tiny particles traveling in straight lines, are reflected from objects into our eyes. He understood that light must travel at a high but finite velocity, and that refraction is caused by the velocity being different in different substances. He also studied spherical and parabolic mirrors, and understood how refraction by a lens will allow images to be focused and magnification to take place. He understood mathematically why a spherical mirror produces aberration. René Descartes (1596-1650) held that light was a disturbance of the plenum, the continuous substance of which the universe was composed. In 1637, he published a theory of the refraction of light that assumed, incorrectly, that light traveled faster in a denser medium than in a less dense medium. Descartes arrived at this conclusion by analogy with the behavior of sound waves. Although Descartes was incorrect about the relative speeds, he was correct in assuming that light behaved like a wave and in concluding that refraction could be explained by differences in the speed of light in different media. Consequently, Descartes' theory is often regarded as the forerunner of the wave theory of light. Pierre Gassendi (1592-1655), an atomist, proposed a particle theory of light that was published posthumously in the 1660s. Isaac Newton studied Gassendi's work at an early age, and preferred that view to Descartes' theory of the plenum. In his Hypothesis of Light of 1675, he stated that light was composed of corpuscles (particles of matter) that were emitted in all directions from a source. One of Newton's arguments against the wave nature of light was that waves were known to bend around obstacles, but light traveled only in straight lines. He did, however, explain the phenomenon of the diffraction of light (which had been observed by Francesco Grimaldi) by allowing that a light particle could create a localized wave in the aether. Newton's theory could be used to predict the reflection of light, but its explanation of refraction depended on the incorrect assumption that light accelerated upon entering a denser medium because the gravitational pull was greater. Newton published the final version of his theory in his Opticks of 1704. His reputation helped the particle theory of light to hold sway during the eighteenth century. In the 1660s, Robert Hooke published a wave theory of light. Christiaan Huygens worked out his own wave theory of light in 1678, and published it in his Treatise on light in 1690. He proposed that light was emitted in all directions as a series of waves in a medium called the luminiferous ether. As waves are not affected by gravity, it was assumed that they slowed down upon entering a denser medium. The wave theory predicted that light waves could interfere with each other like sound waves (as noted around 1800 by Thomas Young), and that light could be polarized. Young showed by means of a diffraction experiment that light behaved as waves. He also proposed that different colors were caused by different wavelengths of light, and explained color vision in terms of three-colored receptors in the eye. Another supporter of the wave theory was Leonhard Euler. He argued in Nova theoria lucis et colorum (1746) that diffraction could be explained more easily by a wave theory. 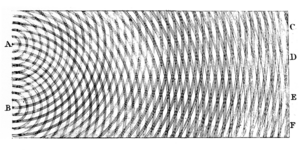 Later, Augustin-Jean Fresnel independently worked out his own wave theory of light and presented it to the Académie des Sciences in 1817. Simeon Denis Poisson added to Fresnel's mathematical work to produce a convincing argument in favor of the wave theory, helping overturn Newton's corpuscular theory. The weakness of the wave theory was that light waves, like sound waves, would need a medium for transmission. A hypothetical substance called the luminiferous aether was proposed, but its existence was cast into strong doubt in the late nineteenth century by the Michelson-Morley experiment. 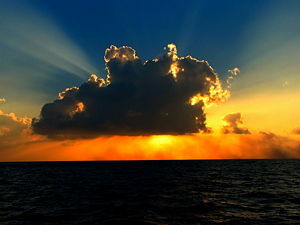 Newton's corpuscular theory implied that light would travel faster in a denser medium, while the wave theory of Huygens and others implied the opposite. At that time, the speed of light could not be measured accurately enough to decide which theory was correct. The first person to make a sufficiently accurate measurement was Léon Foucault, in 1850. His result supported the wave theory, and the classical particle theory was finally abandoned. 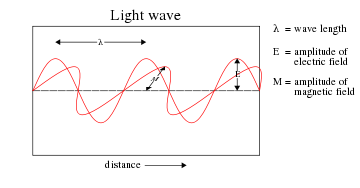 A linearly-polarized light wave frozen in time and showing the two oscillating components of light; an electric field and a magnetic field perpendicular to each other and to the direction of motion (a transverse wave). In 1845, Michael Faraday discovered that the angle of polarization of a beam of light as it passed through a polarizing material could be altered by a magnetic field, an effect now known as Faraday rotation. This was the first evidence that light was related to electromagnetism. Faraday proposed in 1847 that light was a high-frequency electromagnetic vibration, which could propagate even in the absence of a medium such as the ether. Faraday's work inspired James Clerk Maxwell to study electromagnetic radiation and light. Maxwell discovered that self-propagating electromagnetic waves would travel through space at a constant speed, which happened to be equal to the previously measured speed of light. From this, Maxwell concluded that light was a form of electromagnetic radiation: he first stated this result in 1862 in On Physical Lines of Force. In 1873, he published A Treatise on Electricity and Magnetism, which contained a full mathematical description of the behavior of electric and magnetic fields, still known as Maxwell's equations. Soon after, Heinrich Hertz confirmed Maxwell's theory experimentally by generating and detecting radio waves in the laboratory, and demonstrating that these waves behaved exactly like visible light, exhibiting properties such as reflection, refraction, diffraction, and interference. Maxwell's theory and Hertz's experiments led directly to the development of modern radio, radar, television, electromagnetic imaging, and wireless communications. The wave theory was wildly successful in explaining nearly all optical and electromagnetic phenomena, and was a great triumph of nineteenth-century physics. By the late nineteenth century, however, a handful of experimental anomalies remained that could not be explained by or were in direct conflict with the wave theory. One of these anomalies involved a controversy over the speed of light. The constant speed of light predicted by Maxwell's equations and confirmed by the Michelson-Morley experiment contradicted the mechanical laws of motion that had been unchallenged since the time of Galileo, which stated that all speeds were relative to the speed of the observer. where E is energy, m is mass, and c is the speed of light. Maxwell's theory predicted that the energy of a light wave depends only on its intensity, not on its frequency. Nevertheless, several independent experiments showed that the energy imparted by light to atoms depends only on the light's frequency, not on its intensity. For example, some chemical reactions are provoked only by light of frequency higher than a certain threshold; light of frequency lower than the threshold, no matter how intense, does not initiate the reaction. Similarly, in a phenomenon called the photoelectric effect, electrons can be ejected from a metal plate by shining light of sufficiently high frequency on it; the energy of the ejected electrons is related only to the light's frequency, not its intensity. where is the energy frequency and h is a constant, called Planck's constant. To explain the experimental observations that did not fit the classical wave model of light, Albert Einstein extended Planck's idea of energy quanta and proposed (in 1905) that light (electromagnetic radiation) is made up of quanta of energy. The quanta of light were named photons. Between 1905 and 1917, he gradually developed the modern concept of the photon. The photon model accounted for the frequency dependence of light's energy, and it explained the ability of matter and radiation to be in thermal equilibrium. Other physicists sought to explain the anomalous observations by semiclassical models, in which light is still described by Maxwell's equations, but the material objects that emit and absorb light are quantized. Although these semiclassical models contributed to the development of quantum mechanics, further experiments proved Einstein's hypothesis that light itself is quantized. As it originally stood, this theory did not explain the simultaneous wave- and particle-like natures of light, though Planck would later work on theories that did. In 1918, Planck received the Nobel Prize in Physics for his part in the founding of quantum theory. In this manner, physicists began to accept the notion that light is made up of photons, each of which has a wave-like nature and a particle-like nature. This idea came to be called wave–particle duality. In 1924, Louis de Broglie proposed that electrons also exhibited wave–particle duality. The wave nature of electrons was experimentally demonstrated by Davisson and Germer in 1927. Einstein received the Nobel Prize in 1921 for his work with the wave–particle duality of photons (thereby explaining the photoelectric effect), and de Broglie followed in 1929 for his extension to electrons and other particles. The quantum mechanical theory of light and electromagnetic radiation continued to evolve through the 1920s and 1930s, culminating with the development during the 1940s of the theory of quantum electrodynamics, or QED. This so-called quantum field theory is among the most comprehensive and experimentally successful theories ever formulated to explain a set of natural phenomena. QED was developed primarily by physicists Richard Feynman, Freeman Dyson, Julian Schwinger, and Shin-Ichiro Tomonaga. Feynman, Schwinger, and Tomonaga shared the 1965 Nobel Prize in Physics for their contributions. Light pushes on objects in its way, just as the wind would do. This pressure is readily explainable by the particle theory: photons strike an object and transfer their momentum to it. For example, light pressure can cause asteroids to spin faster, acting on their irregular shapes as on the vanes of a windmill. Some have proposed that solar sails might accelerate spaceships in space. Although the motion of the Crookes radiometer was originally attributed to light pressure, this interpretation is incorrect. The characteristic Crookes rotation is the result of a partial vacuum. This should not be confused with the Nichols radiometer, in which the motion is directly caused by light pressure. 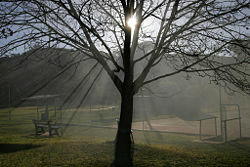 The sensory perception of light plays a central role in spirituality (vision, enlightenment, darshan, and Tabor Light). The presence of light as opposed to its absence (darkness) is a common metaphor for good versus evil, knowledge versus ignorance, and similar concepts. ↑ What Is a Light Source? Light Sources.org. Retrieved December 19, 2007. ↑ Jean Louis Aubert (1760). Memoires pour l'histoire des sciences et des beaux arts. Paris: Impr. de S. A. S.; Chez E. Ganeau, 149. Retrieved December 19, 2007. ↑ Sir David Brewster (1831). A Treatise on Optics. (London: Longman, Rees, Orme, Brown & Green and John Taylor), 95. Retrieved December 19, 2007. ↑ History of Photography and the Camera: Pinhole Camera and Camera Obscura. About.com. Retrieved December 19, 2007. ↑ Wilhelm Wien Nobel Lecture Delivered 11 December 1911. Retrieved August 8, 2007. ↑ Max Planck's Nobel Lecture Delivered 2 June 1920. Retrieved August 8, 2007. ↑ Albert Einstein, A Heuristic Model of the Creation and Transformation of Light. Retrieved August 7, 2007. ↑ The Development of Our Views on the Composition and Essence of Radiation. Albert Einstein,. Retrieved August 7, 2007. ↑ (German) A. Einstein, "Strahlungs-emission und -absorption nach der Quantentheorie," Verhandlungen der Deutschen Physikalischen Gesellschaft 18 (1916):318. ↑ (German) A. Einstein, "Zur Quantentheorie der Strahlung," Mitteilungen der Physikalischen Gesellschaft zu Zürich 16 (1916): 47. ↑ Kathy A. Svitil, 2004. Asteroids Get Spun By the Sun. Discover Magazine. Retrieved December 19, 2007. ↑ P. Lebedev, 1901. Untersuchungen über die Druckkräfte des Lichtes. Ann. Phys. 6:433. ↑ E.F. Nichols, & G.F. Hull. 1903. The Pressure due to Radiation. The Astrophysical Journal 17 (5): 315-351. Retrieved December 19, 2007. Hecht, Eugene. 2001. Optics. 4th ed. Pearson Education. ISBN 0805385665. Jackson, John David. 1975. Classical Electrodynamics, 2nd ed. New York: John Wiley & Sons. ISBN 047143132X. Perkowitz, Sidney. 1996. Empire of light: a history of discovery in science and art. Washington, DC: Joseph Henry Press. ISBN 0309065569. Reitz, John, Frederick Milford, and Robert Christy. 1992. Foundations of Electromagnetic Theory, 4th ed. Addison Wesley. ISBN 0201526247. Serway, Raymond A., and John W. Jewett. 2004. Physics for Scientists and Engineers, 6th ed. Brooks/Cole. ISBN 0534408427. Tipler, Paul. 2004. Physics for Scientists and Engineers: Electricity, Magnetism, Light, and Elementary Modern Physics, 5th ed. W. H. Freeman. ISBN 0716708108. Waldman, Gary. 2002. Introduction to Light: The Physics of Light, Vision, and Color. Mineola, NY: Dover Publications. ISBN 048642118X. Zajonc, Arthur. 1995. Catching the light: the entwined history of light and mind. New York, NY: Oxford University Press. ISBN 0553089854. This page was last modified on 6 July 2018, at 16:37.